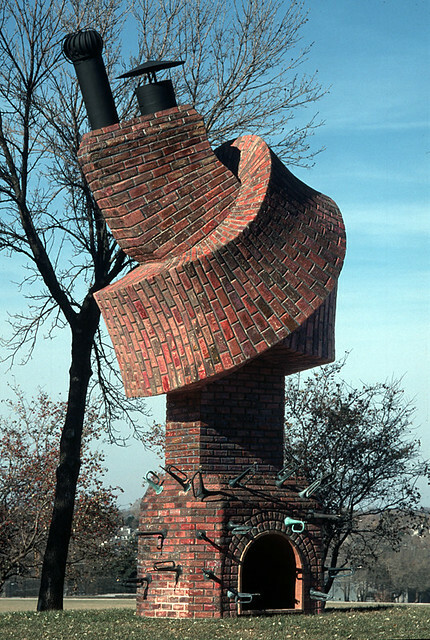 Here is an unusual looking chimney, twisted into a knot. It is actually an abstract sculpture called "Performance Piece" on the campus of Johnson County Community College, Overland Park, Kansas, USA. Created by renowned sculptor Dennis Oppenheim in year 2000, the 7.3 metres (24 feet) high sculpture is made from galvanized steel, epoxy, pigments, cement, bugles, fire brick, foam and fiberglass. "... invites one to consider the fusion of architecture and musical performance. A chimney is turned into a wind instrument, suggesting one could play, or perform it. The cavity of a functional object (chimney) is considered for it's sound producing qualities. In the same way, one could consider, playing or performing a building, by walking through it."